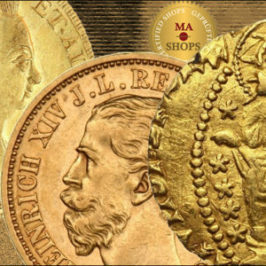 MA-Shops: 20 Dollar Gold (1849-1907). My previous blog, about the Morgan Dollar was a small success. 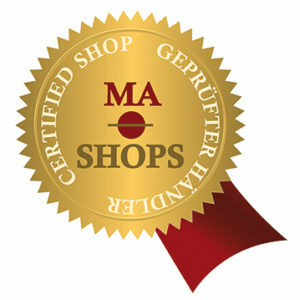 It seems that there is a significant interest in information about coins from the USA. This is not strange because these coins have several great elements within them. This huge interest can be explained as follows. At first a lot of people feel themselves attracted to the USA and their history and collecting is a very popular way to deal with history. Secondly these coins are from a high aesthetic level. You cannot deny that there is some beauty in these coins. 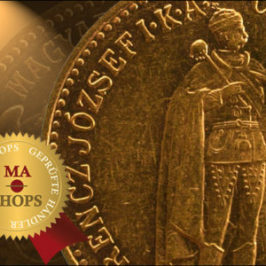 Real artists have thought about the designs of these coins which lead to beautiful coins. 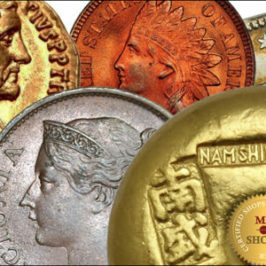 These two elements who made coins from the USA wanted all over the world make them also very valuable in worth. The demand for coins from the USA keeps rising. Especially when it comes to coins in a high quality. This development has a correlation with the fact that these coins are also very popular with investors. 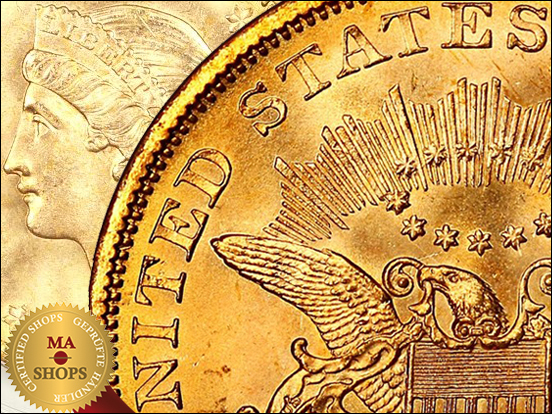 Therefore, I will discuss in this blog another famous coin from the USA. The 20 dollar Liberty Head/Double Eagle. Scarce proof double eagle with fantastic eye appeal and gleaming fields. A few scattered hairlines are noticeable, but the overall eye appeal is simply mind-bogglingly attractive. CAC approved for quality. 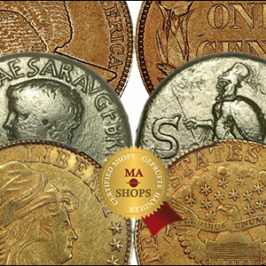 The iconography of the coins is typical from the USA. The head of liberty is depicted in a classical way. The Greco-Roman style. She looks to the left and she is carrying her hair backwards. She wears a diadem, which is inscribed with a typical term that is deeply rooted in the USA, ‘’Liberty’’. The head is surrounded by 13 stars. This refers of course to the number of states in the USA during the year of issue. 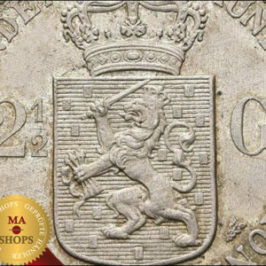 The iconography on the reverse is a typical American heraldic eagle holding a double ribbon with the characteristic American phrase in Latin’’ E Pluribus Unum’’. This means: One out of many. This is the traditional motto of the United States. The 20 dollar Liberty Head was first minted in 1849 but in this year only a several patterns were minted. Nowadays only one specimen is known of this year. 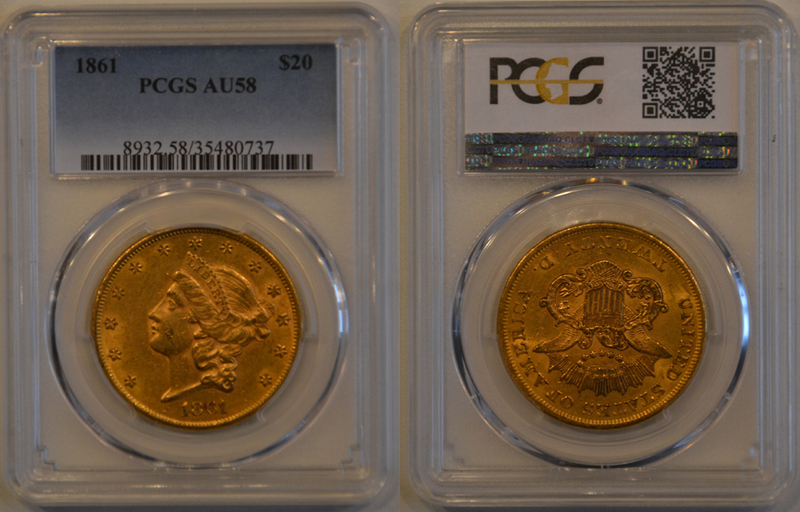 The coin was minted until 1907, the 20 dollar was still minted after this date but the design changed. The mass of the coin is 33.431 g and the diameter was 34.1mm. the coin was minted Carson City, Denver, New Orleans and San Francisco. The mintmark can be found below the eagle on the reverse. The alloy of the coin is made from 90% gold and 10% copper. 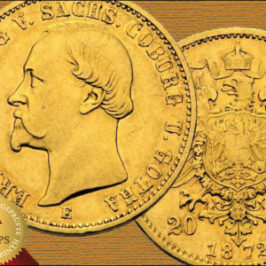 With almost a troy ounce of gold this coin is also very popular by investors in gold. This coin can be collected in several ways. But it is very popular to seek for the highest quality you can afford. And I think this is trend we can see by all modern coins. This something I will discuss in another blog.